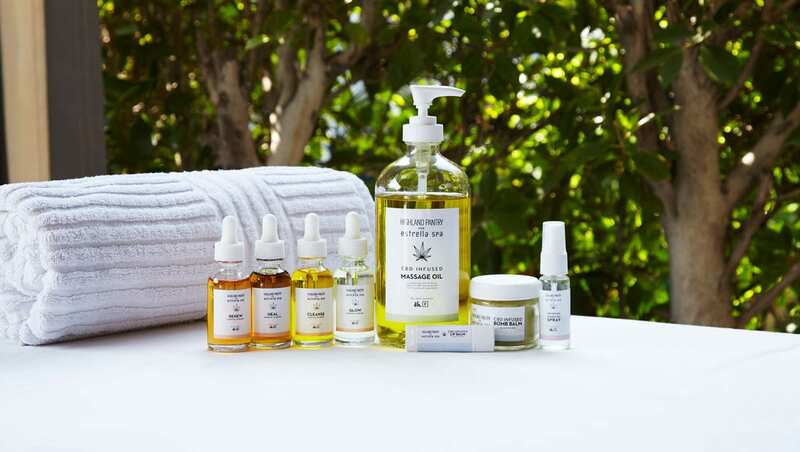 LA-based cannabis wellness brand Highland Pantry has developed a CBD infused spa experience exclusively for Estrella Spa at Avalon Hotel & Bungalows Palm Springs. The first and only hemp-based healing practice on the menu of a Palm Springs hotel spa, Highland Pantry’s offering centers around a choice of 4 different CBD infused ‘benefits-based’ massage treatments, all using hand-crafted & co-branded massage oils, essential oils, a body balm and a face spray. Completely reset with Swedish-based massage strokes that unwind the body, increase circulation, decrease stress and balance you from top to toe. Release energetic and cellular stagnation with massage strokes intended to invigorate tissues and increase circulation–featuring digestion enhancing abdominal massage. Release overused and contracted tissues with deep muscle-specific work. Decrease overall tension and increase mobility with herbal heat packs or hot stones, if desired. Slow down with supportive and gentle Yin-style touch that calms your nervous system and helps rebalance your endocrine system. Highland Pantry is a health and wellness brand based in Los Angeles. Their products are carefully crafted with the best ingredients and made to make you feel good, inside and out. Highland Pantry topicals have been shown to alleviate muscle strain, soothe the skin, and help you relax. Their CBD infused topicals line utilizes the non-psychoactive hemp-based compound Cannabidiol (CBD), a close cousin of the cannabis plant which has anti-inflammatory and antioxidant properties. CBD (or Cannabidiol) is derived from the hemp plant, a close cousin of the cannabis plant. This non-psychoactive compound has a multitude of health benefits and has even been shown to treat diseases such as epilepsy and cancer. CBD acts as an anti-inflammatory, antioxidant, anti-anxiety, antiemetic, anxiolytic and antipsychotic agent. Developed exclusively for the CBD infused experiences at Estrella Spa, the Highland Pantry topicals collection includes all-natural massage oils, essential oils, a body balm and a specially formulated facial spray.